Many people have heard about Borneo and Sumatra due to their famous animal inhabitants. In the week’s instalment of Animal Travels we’ll explore the wildlife of Borneo and Sumatra!! Of course it only makes sense to start with the most popular animal resident of the islands. The Orang-utan is best located in the Danum Valley, Gunung Leuser and the Kinabatangan River. There are two species of Orang-utan. The Bornean Orang-utan (Pongo pygmaeus) and the Sumatran Orang-utan (Pongo abelii). Both of the orang-utan species are in grave danger as both as classified as ‘Critically Endangered’ by the IUCN Red List. Fun fact: Orang-utans share around 97% of the same DNA as humans! Moving on to another famous Sumatra species, the Sumatran Rhino (Dicerorhinus sumatrensis). The best places to visit in order to see these rhinos in the wild is to the Gunung Leuser, Bukut Barisan Selatan and Way Kambas National Parks. The Sumatran Rhino has recently been declared as Extinct in the Wild in Myanmar. Fun fact: Sumatran Rhinos are the smallest (and hairiest!) rhino species. One of my favourite species is the next in this Animal Travels adventure. The Sumatran Tiger (Panthera tigris sumatrae) is a subspecies of tiger. The best place to visit to view this species in the wild is by heading to the Satwa Sumatra Birding Guesthouse or visit Way Kambas National Park. You will need luck to be on your side to see this animal in the wild as their numbers are dwindling and they are known for being notoriously difficult to spot. Fun fact: Sumatran Tigers are the smallest subspecies of tiger in the world. Borneo and Sumatra are also home to the Proboscis Monkey (Nasalis larvatus) famous for its nose! To see in the wild the best place to head is to the Labuk Bay Proboscis Monkey Sanctuary which is located about 38km from Sandakan airport. These monkeys are facing problems from habitat destruction which is severely reducing their population numbers. Furthermore, the species is relatively lethargic which makes them easy to hunt and without legal measures being put into place the species is likely to be hunted into extinction. 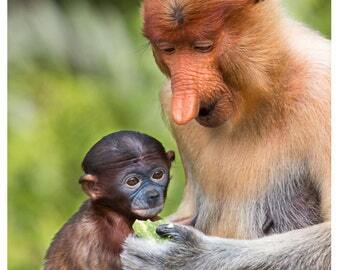 Fun fact: Baby Proboscis monkeys are born with black fur and a bright blue face! Sun Bears (Helarctos malayanus) can also be found in Borneo and Sumatra and are particularly abundant. To find a Sun Bear in Borneo you just need to head to one of the tropical rainforests on the islands. Fun fact: Also known as the Honey Bear as this is their favourite food (Winnie the Pooh would be jealous). For the final species of this week’s Animal Travels, the Sunda Clouded Leopard (Neofelis diardi). Clouded Leopards were originally considered a single species until recent years when they were split using analysis from mitochondrial DNA, micro-satellites and chromosomal differences. The best place to visit if you want to spot the Sunda Clouded Leopard in the wild is to head to the Kinabatangan Wildlife Sanctuary, the Tabin Forest Reserve or into the Danum Valley. Fun fact: Clouded Leopards spend nearly all their lives in the trees, so if you want to spot one, don’t forget to look up!